Plastic Air Vent Covers Discounts Apply ! AC Draftshields cover vents to prevent warm or cool air loss. 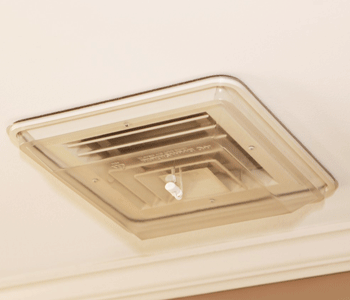 Plastic vent covers are easily installed and can be used for several seasons. You can cover vents in rooms that are rarely used and conserve energy. Plastic vent covers are lightweight and made of a durable clear plastic with foam insulation around the edges. When you cover vents with AC Draft shield products you can be sure of a snug fit and a quality made product. These plastic vent covers are ideal for use in both commercial and residential applications. Note: that the measurements of the plastic vent covers are the inside measurements of the vent cover and the seal of the vent cover will sit outside of the given measurement. Use the drop down arrow to select what size cover vent you would like to order: 15 x 8, 16 x 8, 12 x 12, 14 x 14 or 24 x 24. Please Note the 24x24 size will drop ship direct from the manufacturer. Use these plastic vent covers to cover vents anywhere you want to prevent air loss in your home or office. Don't delay order today!